People laughed when an Italian-style castle started rising in the middle of a hillside vineyard in northern Napa Valley. I was a bit skeptical, too, wondering if Napa was going to start looking like Las Vegas. But the idea wasn't as radical as it seemed. Going back to the early days in Napa Valley, vintners have created buildings to honor their homeland. The lovely Rhine House at Beringer is a perfect example. Castello di Amorosa is the creation of Dario Sattui, who wanted to honor his grandfather Vittorio by building something that paid homage to his home in Italy. By the time he finished, he had created a 121,000-square-foot, 12th-century Tuscan style, castle to house his winery. Made from authentic materials and in the style of a real castle that would have been built in sections over many years, it's as close to Italy as you'll get in the United States. Tour options at Castello di Amorosa change frequently. Visit their website for more information. You can also skip the guided tour and pay an entrance fee, which allows you to look around on your own and taste a few of their wines in the main tasting room. At Castello di Amorosa, the building is the star of the show. It's an attraction in its own right, no matter how much you like wine. They throw awesome parties! Wine Club members can attend the annual Pagan Ball or the New Year's Eve Masquerade Ball - parties that are so much fun that it's worth joining just to get an invitation. If you think the idea of a castle is fun, go just for that. Most kids (and many adults) especially like the medieval torture chamber, as well as the moat and drawbridge. I like the frescoes in the Great Hall the best, but it's all gorgeous. The castle is a perfect place for a marriage proposal, and they offer several packages for that ultimate romantic moment. 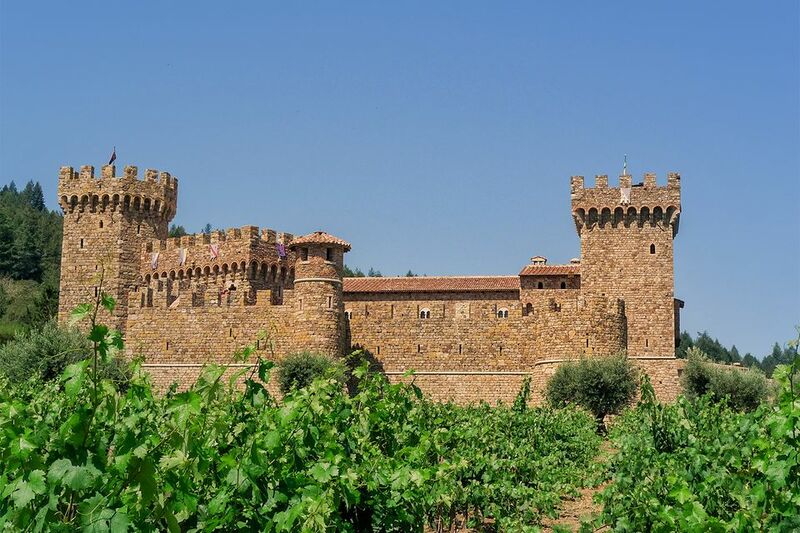 Castello di Amorosa produces 17 Italian-style wines, including Pinot Grigio, Pinot Bianco, Chardonnay, Merlot, Cabernet Sauvignon, Super Tuscan Blends and dessert wines. Wine expert Robert Parker awarded their 2012 Il Barone Cabernet Sauvignon 93 points. It also won a double gold medal at the 2015 American Fine Wine Competition. Online reviewers often mention how much they liked the castle. In fact, they talk about it more than they do the wine. It gets four stars out of five at Yelp. You can also read visitor reviews of Castello at Yelp and Tripadvisor. Castello di Amorosa is one of the busiest Napa Valley wineries. Reservations are essential in all but the quietest times of the year. They offer special, lower prices for children and young adults. Children aged 5 and older can go on the guided tours. In case you want to know, Castello di Amorosa's vineyards are in the Diamond Mountain District of Napa Valley. They also have vineyards in Napa, Anderson Valley, and the Russian River Valley, near Sebastopol in Sonoma County. They produce about 8,000 cases per year. Castello di Amorosa Winery is located between St. Helena and Calistoga on CA Hwy 29. You can't see the castle from the highway, so you will need to look for their address and sign instead. As is common in the travel industry, the writer was provided with a complimentary tour for the purpose of reviewing Castello di Amorosa Winery. While it has not influenced this review, About.com believes in full disclosure of all potential conflicts of interest.